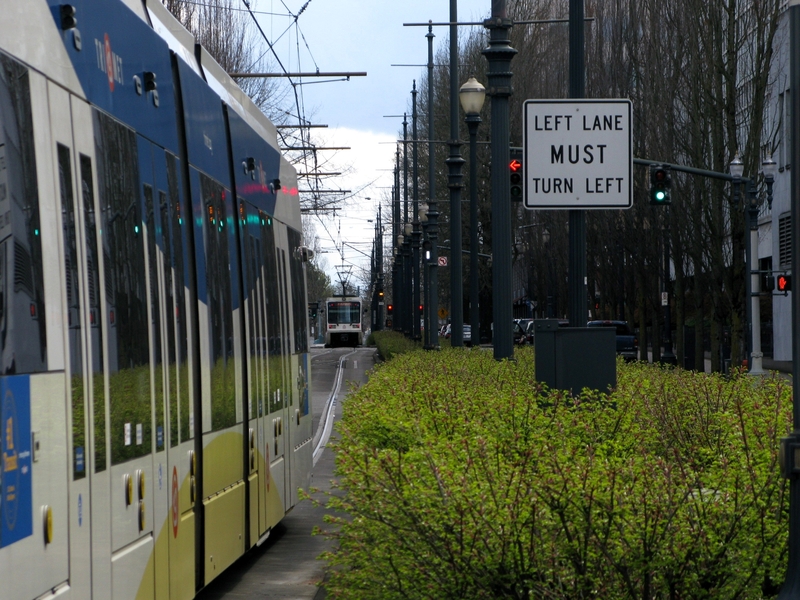 A continuation of the last improving transit speed post, which is building off of the discussion over at Portland Transport, and now specifically focusing on people’s suggestions for speeding up travel time along NE Holladay. I hope this provides something of an operational perspective as to why some things are the way they are and that might prove to be a hindrance in redesigning platform placement. 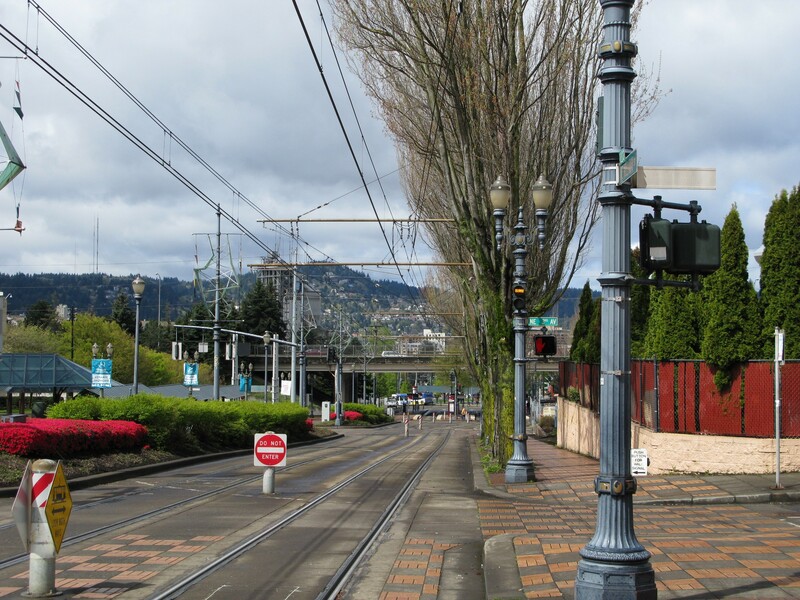 These are not necessarily insurmountable obstacles, but are, at the very least, obstacles that prevent any of the suggestions from the Portland Transport post from being enacted immediately. 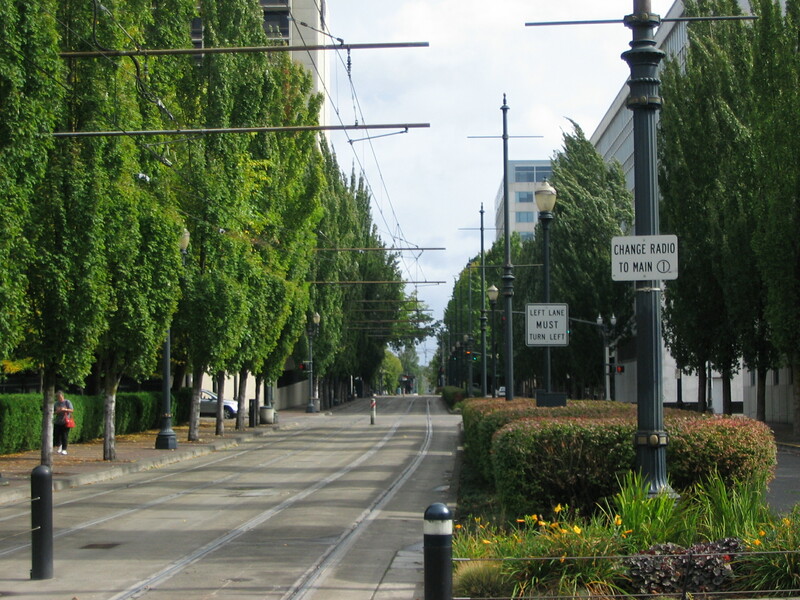 Given those lower passenger counts compared to RQ and Lloyd Center, many people have put forth the argument that Convention Center and NE 7th could be closed to speed up travel time on Holladay without severe impact to passengers. 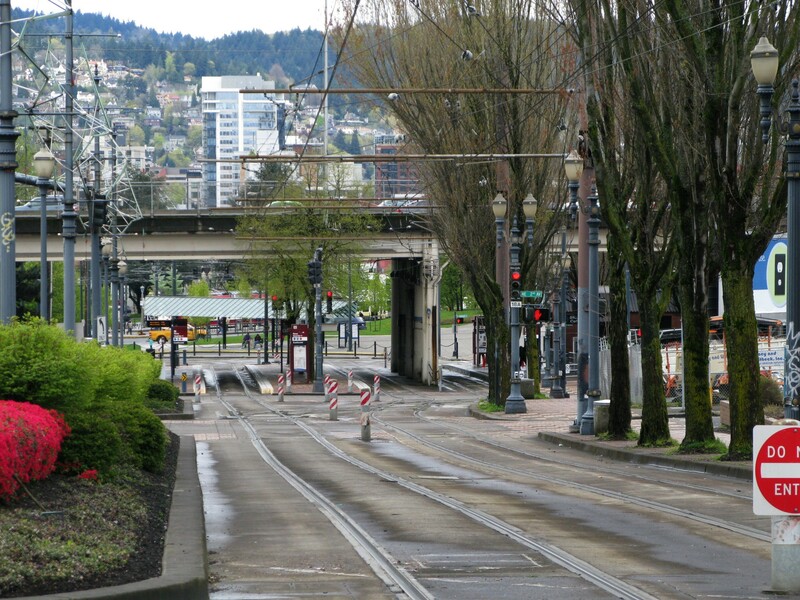 However, both of those platforms serve an important purpose on Holladay – not so much for passenger loading, but rather as a necessity to travel along this section of the alignment. 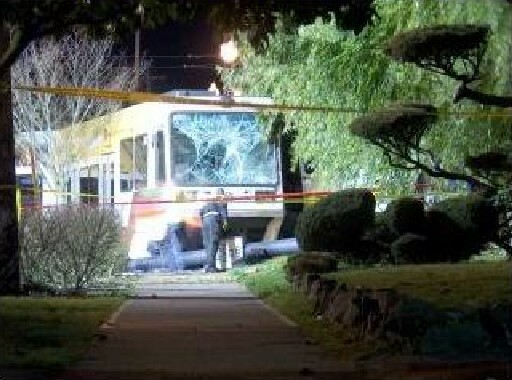 The short explanation is that those platforms are needed to call signals/switches on Holladay. The long explanation: keep reading. For one thing, trains at all stops along Holladay need to call the pre-empt signals to proceed, which will then cascade into the next platform. But OCC & NE 7th have an additional complication. 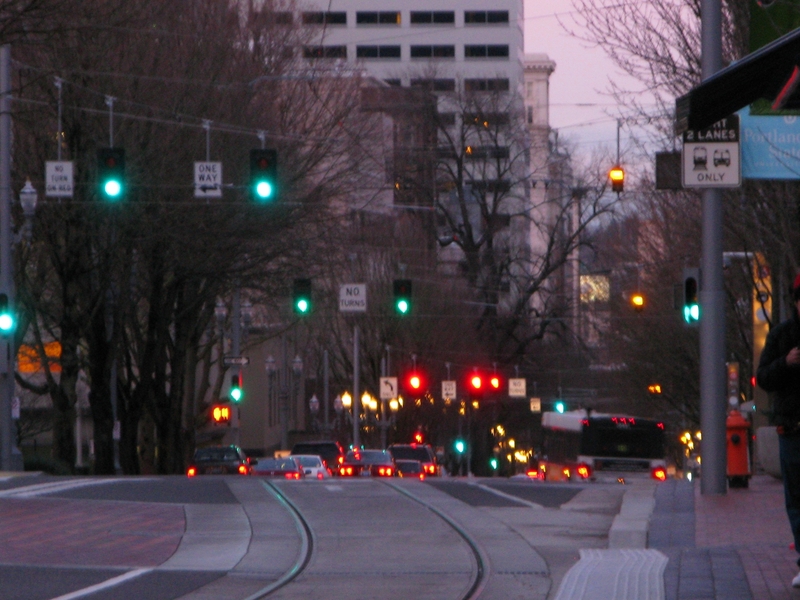 The alignment on Holladay from just past Rose Quarter to just before Lloyd Center is between two sets of switches. 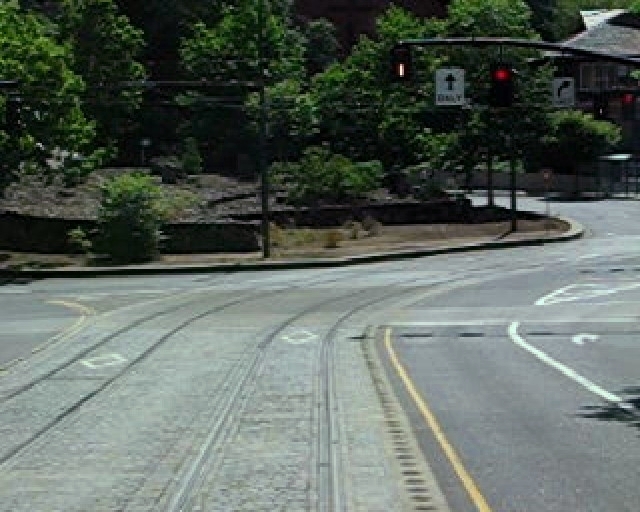 On the west (click for map), there’s a crossover as well as switches to diverge into the special events track, westbound main, or trolley barn at Rose Quarter. On the eastern side, there are switches to diverge a train into (or out of) the Doubletree Siding. Going back to my earlier posts on signal types, since all of these switches are in pre-empt territory, they are associated with ABS/pre-empt combination signals and are protected by ATS magnets. Let’s start with the switches into the Doubletree Siding on the eastern side. 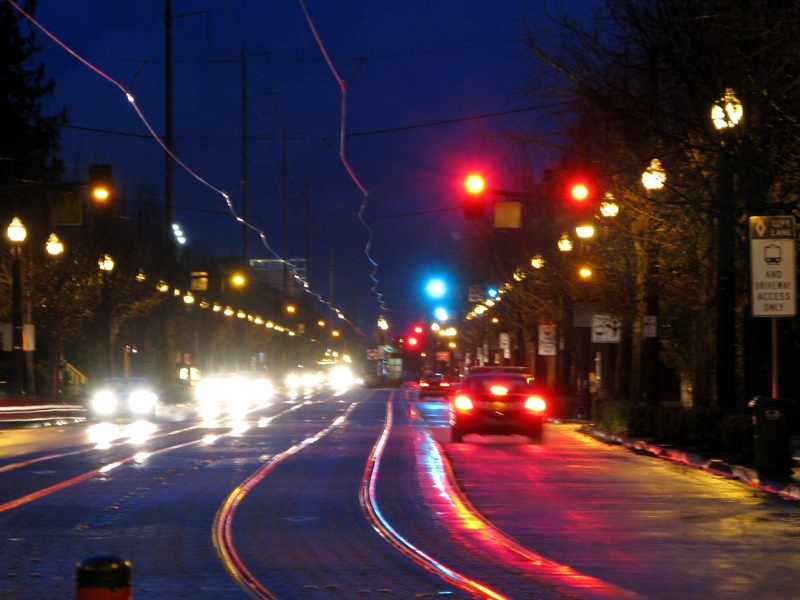 The above picture (click for larger) shows what an eastbound train at NE 7th sees. 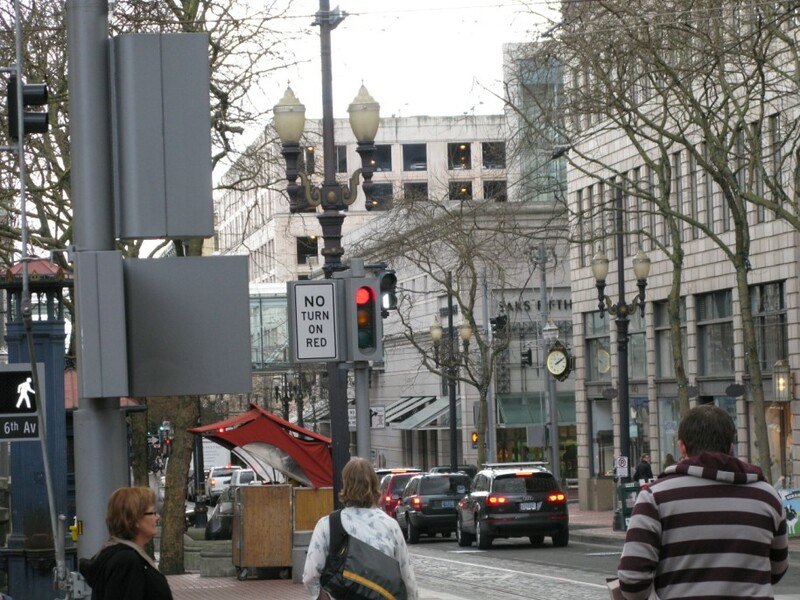 Of interest is combination signal 20A immediately prior to the Lloyd Center platform. 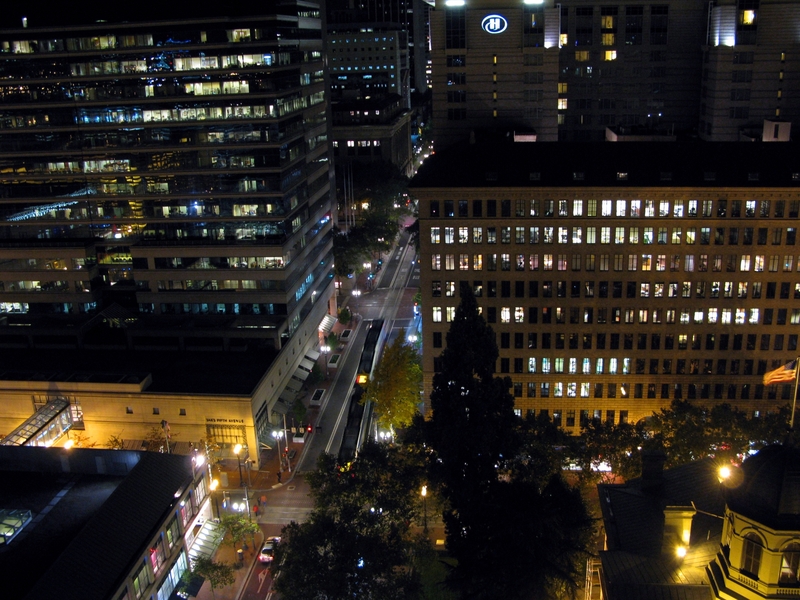 The zoom lens makes it look closer than it really is – a better perspective (though not as clear of a photo) is this old picture from when NE 7th was where trains would switch radio channels to Main 1 or Main 3. 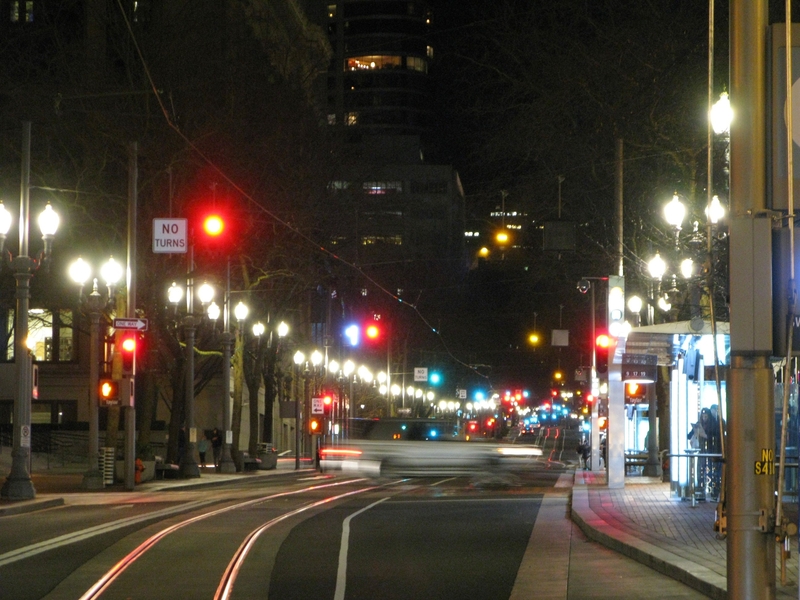 In that linked photo, 20A is the red light at NE 11th. 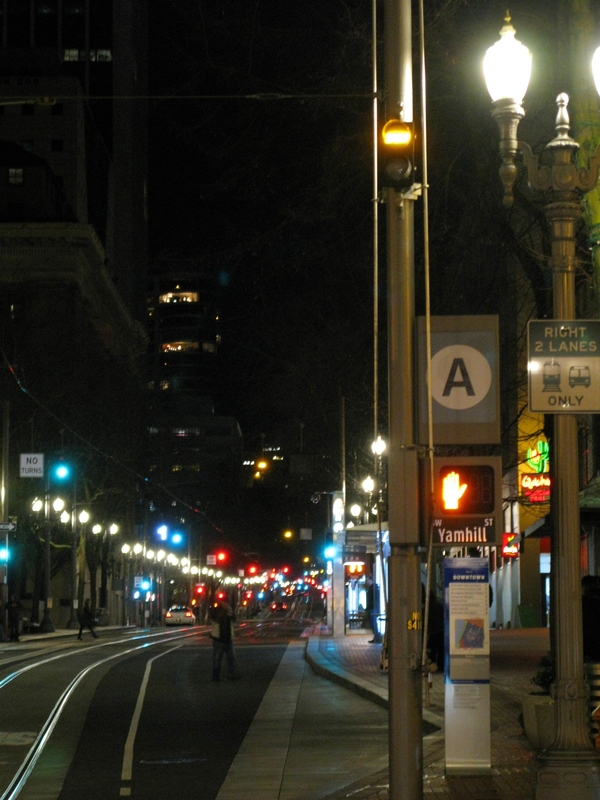 In this above photo, you can see that the intersection at 9th is has a permissive white vertical pre-empt. 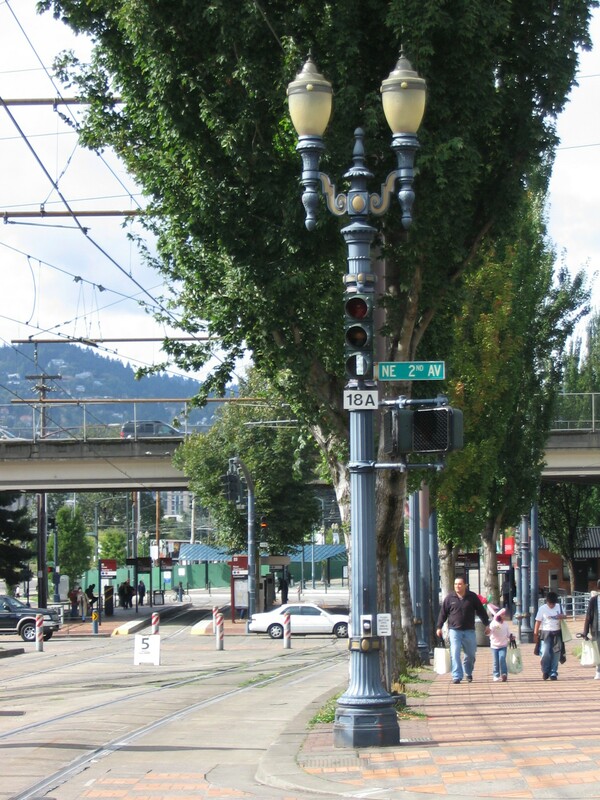 Now look down to NE 11th at the combination signal 20A, which is displaying a yellow horizontal. This informs the operator of an eastbound train at 7th that the power switch that can diverge a train into the Doubletree Siding is aligned to continue east, but 11th is not pre-empted yet. 20A will time out back to a red after a minute, which reactivates the magnet until the next train calls it. ATS magnet visible in foreground, white vertical on 20A in background. 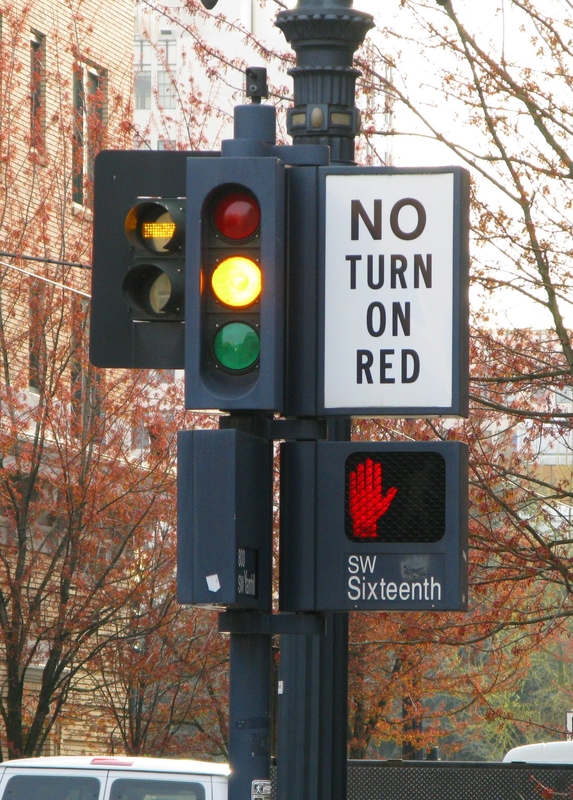 When 20A is red, that ATS magnet will stop an eastbound train before it gets to the intersection at NE 11th. Therefore, 20A must be called by a train before it can proceed through 11th into the Lloyd Center platform, but it needs a place to call 20A from. Rolling calls, or in other words, pressing the call button as you move over a call loop without stopping, are a poor practice. 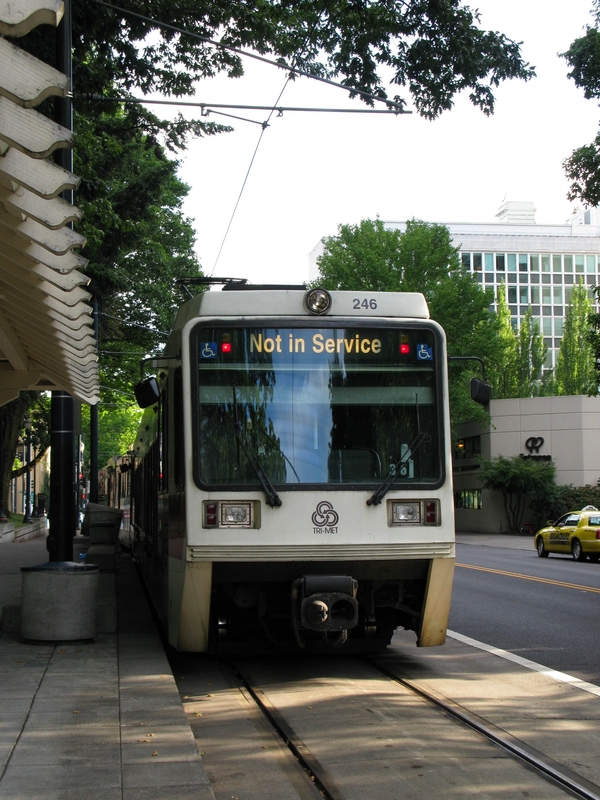 Trains should be at a complete stop over a call loop to call a signal, so there needs to be some place for a train to stop prior to NE 11th to call 20A, and that purpose is served by the NE 7th platform. When placing the call at 7th, rail operators will look down to 20A from there and make sure it drops from a red before proceeding. Looking at OCC on the western side of the Holladay alignment, there are two combination signals that affect train movement from OCC to into Rose Quarter: 18A and 18B. 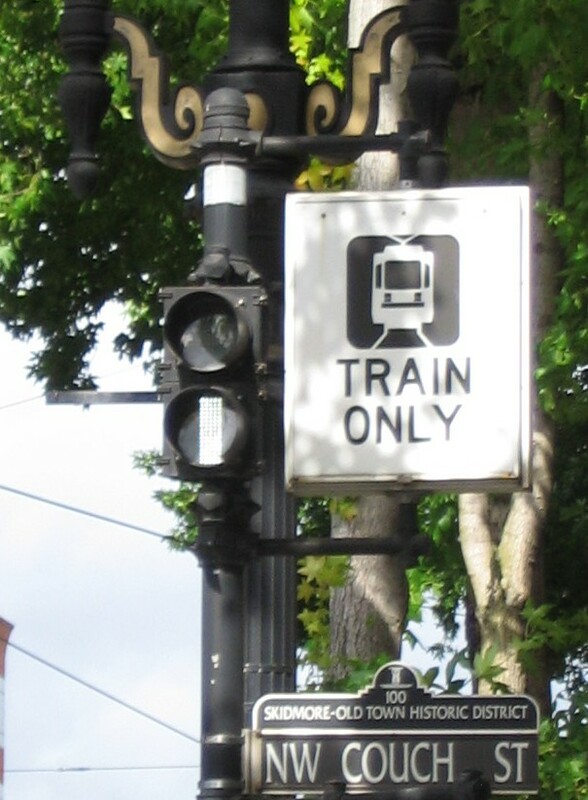 Signal 18A is located on the corner of NE Holladay & 2nd for westbound trains. 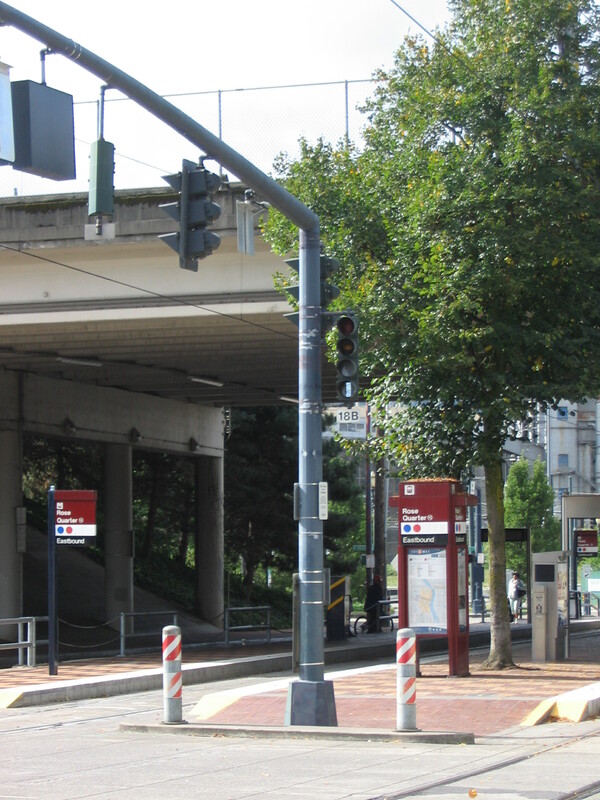 It is associated with switches 13A, 11C, and 11D and the ATS magnet (visible in the above picture as the little yellow square) on the opposite corner of NE 2nd. 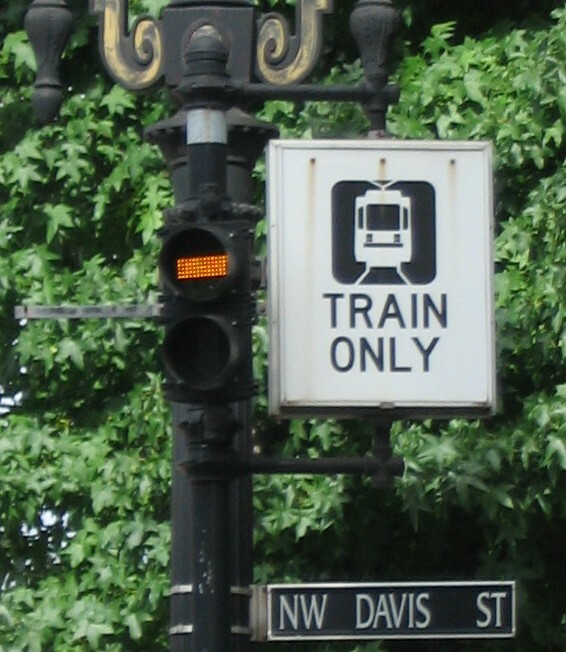 If any of those switches are not properly set for a westbound move from OCC or if there is a conflicting move in progress – for example, a vintage trolley coming out of the trolley barn or turnbacks like last weekend’s streetcar work, 18A will remain red and a westbound train will be tripped at the ATS magnet. To proceed through here, 18A needs to be called by westbound trains from a platform (remember, no rolling calls), which is why OCC is needed. Way down there by the Rose Quarter special events platform is signal 18B, an ABS/pre-empt combination signal that routes a train into the westbound main (click for a more up-close picture of 18B), the special events track, or the trolley barn. Like 18A, 18B is called by westbound trains from OCC, and both need to drop from reds before a train can continue west into Rose Quarter. 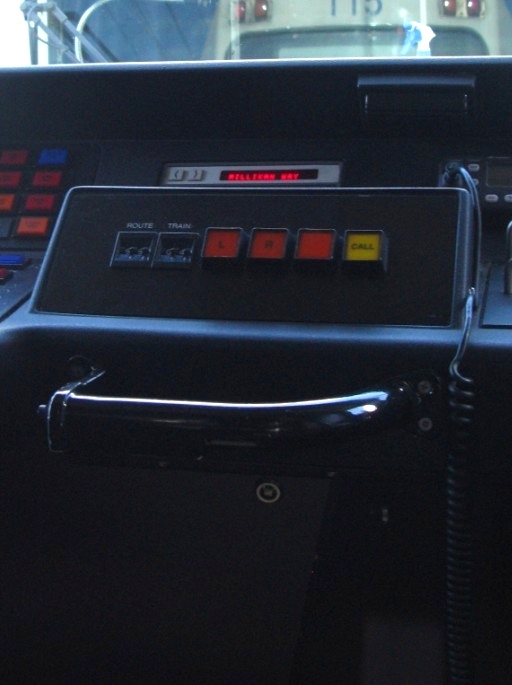 18B doesn’t have an ATS magnet of its own (the magnet at 2nd for signal 18A will stop a train before it gets near 18B) but this signal is still necessary for route selection. Both 18A and 18B will time out back to reds and will need to be called by the next westbound train, ensuring that the switches are properly set and there are no conflicting moves by other trains. As a result, OCC is another platform that can’t be skipped or closed because westbound trains need a platform to call 18A and 18B from. 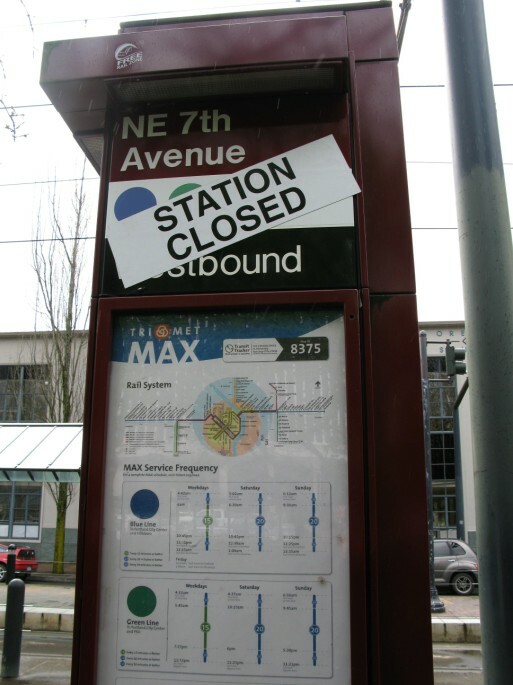 Similar to NE 7th, since trains have to stop here anyway to call the signals, they may as well service the platform. So can either of these stops be closed, moved, etc? Not easily.. NE 7th eastbound and OCC westbound are currently necessary to call their respective ABS/pre-empt combination signals to ensure switch alignment/no conflicting moves by other trains. And while their corresponding westbound and eastbound platforms don’t have combination signals, operators will still call for pre-empt signals to proceed from there. At present, I don’t really see a way to avoid stopping at both of these platforms despite the relatively low passenger on- and off-boarding at these locations. This isn’t to say that it can’t ever be done, but I don’t think skipping either of those platforms can be done as an immediate fix. Washington Street is the pre-empted area at the western end of the Blue Line. In this picture, you can see the pre-empts (all yellow horizontals since there are no trains moving through) on both sides of each intersection, though they’re a little easier to see on the left. Also in this picture, the way the overhead wire zigzags is clearly visible – remember this is done to evenly wear down the carbon shoe on the pantograph. I haven’t posted any video in a while, so here you go. 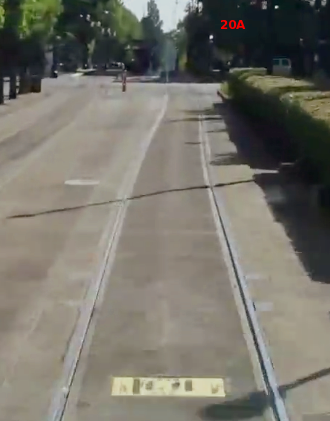 Eastbound from 1st and Morrison to the Rose Quarter, filmed a few years ago.